Over 700 Hit Country Songs!!! At Your Next C&W Gig! Music from the pioneers of C&W to today's hit makers. It contains songs made famous by Roy Acuff Alabama Deborah Allen John Anderson Eddy Arnold Gene Autry Moe Bandy Bobby Bare Bellamy Brothers Garth Brooks Brooks & Dunn Glen Campbell Mary Chapin Carpenter Johnny Cash Roseanne Cash Mark Chestnutt Roy Clark Patsy Cline David Allan Coe John Conlee Billy Ray Cyrus Skeeter Davis Jimmy Dean Diamond Rio Joe Diffie Johnny Duncan Everly Brothers Exile Freddy Fender Red Foley Forester Sisters Janie Frickie Lefty Frizzell Gatlin Brothers Crystal Gayle Don Gibson Mickey Gilley Vern Gosdin Lee Greenwood Merle Haggard Emmylou Harris Faith Hill Ferlin Husky Alan Jackson Sonny James Waylon Jennings George Jones The Judds Toby Keith Sammy Kershaw Alison Krauss Kris Kristofferson Tracy Lawrence Jerry Lee Lewis Patty Loveless Loretta Lynn Barbara Mandrell Mel McDaniel Ronnie McDowell Reba McEntire Tim McGraw Jo Dee Messina Roger Miller Ronnie Milsap John Michael Montgomery Gary Morris Michael Martin Murphy Anne Murray Willie Nelson Juice Newton Oak Ridge Boys Buck Owens Dolly Parton Webb Pierce Elvis Presley Ray Price Charley Pride Collin Raye Jerry Reed Jim Reeves Restless Heart LeAnn Rimes Tex Ritter Jimmie Rodgers Kenny Rogers John Schneider Shenandoah T.G. Sheppard Ricky Skaggs Hank Snow Staler Brothers Doug Stone George Strait B.J. Thomas Mel Tillis Merle Travis Randy Travis Travis Tritt Tanya Tucker Conway Twitty Ricky Van Shelton Porter Wagoner Gene Watson Kitty Wells Dottie West Keith Whitley Don Williams Hank Williams Hank Williams Jr. Tammy Wynette Wynona Trisha Yearwood Dwight Yoakam Faron Young and many, many more. The Fake Disk includes all of the chord progressions in the book. I entered the chords as close as I could to the way they appear in the book. You can load the disk, open the book, and just play or sing along. This book and disk at a party will have everyone singing along. Just browse the song list in the right hand column to see the song titles contained in this book/disk! I also suggested a style for each song from all the styles that were available for Band-in-a-Box when I compiled this disk. It is not necessary to have the book or my styles to enjoy this disk, but your fun will definitely be enhanced if you do. The Fine Print: This disk is GUARANTEED to work with Band-in-a-Box � In the unlikely event the product is defective or gets corrupted during delivery, it will be replaced. � The melody and lyrics to each song are included in the optional Fake BOOKS. � All copyrights are honored and royalties paid to the copyright holders. � It is important to note that all Norton Music Fake DISKS contain chord progressions only... There are no copyrighted melodies or lyrics on the Fake DISKS. The song titles are used only to identify a particular chord progression. � The song titles used are not the only songs to share any particular chord progression but conservation of space limits me to listing only one title per chord progression. � The degree of compatibility of the songs with the currently available styles for Band-in-a-Box varies. � There are no user styles in any of the fake disks either by PG Music (the creators of Band-in-a-Box) or by Norton Music. � As is typical in the software industry, all sales are final. IMPORTANT: Be sure to buy a new (not used) book as there are many different editions of most fake books. 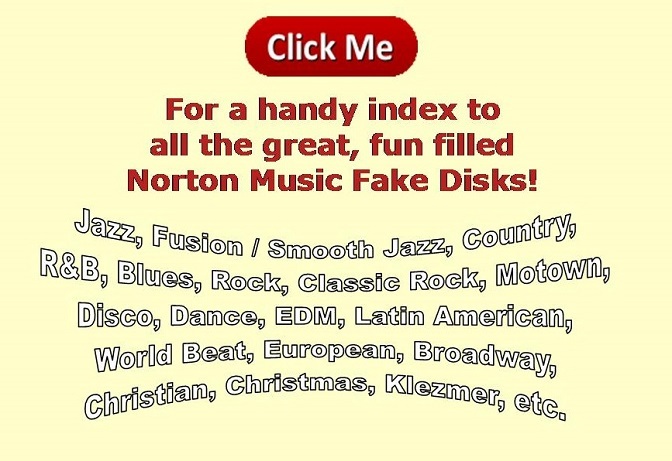 The Norton Music fake disk is compatible only with most recent edition of the fake book. If you buy an used, older edition, all the songs in the disk will not match the songs in the book. Browse the song list in the right hand column to see the song titles contained in this book/disk! "Linked" titles are free samples and are exactly as they appear in the fake disk.